Shop for flea & tick products to protect your cat at VetDepot.com. Providing proper flea and tick control for your cat is part of being a responsible pet owner, but figuring out which one is right for your cat isn’t terribly difficult. The table below will help you compare some of the top brands for cats. By properly using topical or oral flea and tick products, you can prevent infestations and keep your pet safe from parasites. The second table compares two popular flea and tick collars for cats. And always remember this important rule: never use a dog flea treatment on a cat. Some ingredients in them can sick and even kill cats. Spot on products contain a small amount of liquid that you place directly on your cat’s skin. These products usually kill and repel pests like fleas, flea larvae, ticks, mosquitoes, and lice. Different products work on different parasites, but most of the big brands like Frontline Plus and Advantage II protect against both fleas and ticks. 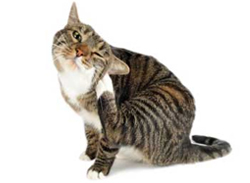 Oral flea control products often appeal to pet owners who are worried about coming into contact with pesticides that are applied to their cat’s coat and skin. Unfortunately, no oral form of tick prevention is available. Capstar kills adult fleas only, but it can be used up to once daily. It’s often used with other products like Program, which are designed to keep immature fleas from developing. Many flea collars offer long-term protection against fleas, flea eggs, and immature fleas--sometimes up to 8 months! Also, these collars can keep your cat safe from ticks for up to half a year before needing to be replaced. Adams and Vet-Kem are both excellent choices.